There are more than 1.2 million people in the UK on warfarin treatment, but fewer than two per cent of them benefit from self-monitoring. People on long-term warfarin need to have regular blood tests to check their internationalised normal ratio (INR), or the level of clotting tendency. These blood tests affect patients’ personal and professional lives making them regularly dependent on attending a hospital, GP surgery or anticoagulation clinic for a simple test. In October 2012, the AntiCoagulation Self-Monitoring Alliance (ACSMA) – comprising four of the UK’s leading heart charities – launched its campaign with the primary objective of ensuring that INR self-monitoring technology is available, accessible and on prescription through the NHS for all eligible patients. 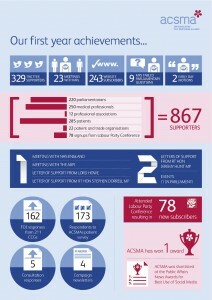 Over the past twenty one months HJCL has driven forward ACSMA’s concerns surrounding self-monitoring technology bringing them to the attention of healthcare professionals, policy makers and Government via a concerted public affairs, parliamentary and media campaign. To date, more than 867 individuals and organisations have pledged support, including Little Hearts Matter, the International Self Monitoring Association of Oral Anticoagulated Patients, the British Heart Foundation, the NHS Alliance and more than 130 MPs and Peers. A Patient Choice Awards ceremony in Parliament, hosted by Virendra Sharma MP with speakers including Shadow Health Minister Andrew Gwynne and Glyn Davies MP.